New indicators on projected population point to stagnation of the child population from 2020 to 2060 across all racial/ethnic groups. With an unchanging child population and growing adult population, the importance of children becomes ever greater. Guest author, Beth Jarosz from the Population Reference Bureau, explores these new indicators and explains how they can help inform policies and programs that support children’s health and well being. California’s total population is expected to grow by more than 10 million people (25 percent) to nearly 51 million between 2020 and 2060. However, the child population is expected to remain virtually unchanged, at just over 9 million, over this same period of time. This forecast, from the California Department of Finance, is based on the current population as well as projections about birth rates, death rates, and migration patterns. Low birth rates contribute to the stable child population forecast while long life expectancy and net in-migration result in projected population growth at older ages. Population forecast information is valuable for many reasons. Forecasts provide decision makers and the public with valuable clues about the future size and characteristics of the population. At the most basic level, a forecast suggests whether a population is going to grow, shrink, or remain about the same. 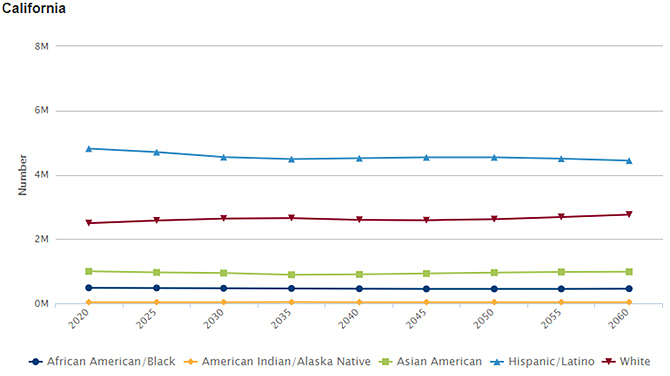 Many forecasts, including those presented here on Kidsdata.org, also provide predictions about the age and gender, racial/ethnic composition, and geographic location of the population in the future. Forecast data are used to predict and plan for future needs such as schools and health care facilities. If a community is expected to grow, local officials would plan for additional school and health care facilities to meet the needs of the growing population. If a community is expected to shrink, officials would want to start planning for how to use any no-longer-needed space. Forecast data are also helpful in what-if analysis. For example, an analyst might ask, “If we could eliminate racial/ethnic disparities in child poverty, what would the effect be on the overall child poverty rate?” Forecast data help to answer those questions. A report from the Lucile Packard Foundation for Children’s Health explores the economic impact of declining birth rates. Ensuring the health and well-being of children in the U.S. has never been more critical to the nation’s economic and political future. The shortage of children means each child—regardless of gender, ethnicity, geographic residence or economic background—is proportionately more important to our future than ever before. See how San Francisco Unified School District is using forecasts to predict future needs. This entry was posted on Tuesday, February 5th, 2019 at 9:18 am. You can follow any responses to this entry through the RSS 2.0 feed. You can leave a response, or trackback from your own site.